What’s the most disgusting thing you have recovered from your Mom bag? Mine has to be a rotten, dried banana peel, endless cookie crumbs or maybe a half eaten granola bar. 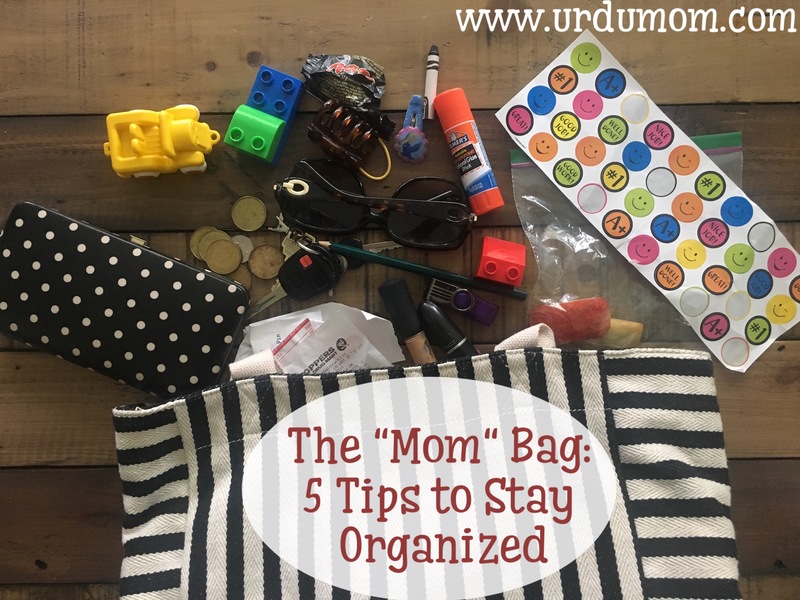 If you struggle to keep your Mom bag organized, read on for tips, tricks and a list of essentials you need to keep on hand to be on top of this game. You need a bag that’s right for your life style. Looks are important, but weigh in on functionality too. For everyday use I love cross bodies because I get to use both my hands freely. I also always pick a bag with a zip to close it completely because my bag topples around a lot. A bag with inside and outside pockets and built in compartments will make organization super easy. Besides the pockets in your handbag, small bags and pouches are your best friend! Keep your makeup essentials in a small bag, receipts in another and get a small cute bag for coins. Designate a spot in your bag for things you regularly need, like the inside pocket for your mobile, front pocket for keys etc. This will help you find things quickly. Once you get home, designate a regular spot in your house where you “park” your bag. Take out any garbage, dirty tissues, useless receipts, left over snacks right away. Regular purging is the key to an organized bag. Every week go through your bag and take out all the clutter that seems to collect on its own: the odd toddler toy, letter from school, half used crayon, a random disposable spoon etc etc. I highly recommend the Naturalene skincare cream by Greeniche made with Jojoba Oil, Aloe Vera, Chamomile and Vitamin E in 100% pure Bee’s Wax. This cream is great for the entire family, be it mommy’s dry hands, dry cheeks on the kids or any minor cuts. I love this all natural moisturizer! More product details here. Hope these tips helped you! Let me know what are your strategies to keep your “Mom” bag organized. Disclaimer: This post is sponsored by Greeniche. All opinions are my own! Previous Post Book Review and Contest: My Eid Mubarak Storybook! Not a mom but these tips are useful for me too! throwing out those random receipts and tissues is my nemesis! great tips! I think that’s a challenge for all us moms! Thanks for dropping by and your comment !